LB-2 #8 Waiting at Walpole. After climbing out of the Charles River watershed and descending into the Neponset River watershed, LB-2 has the opportunity to "cool its wheels". 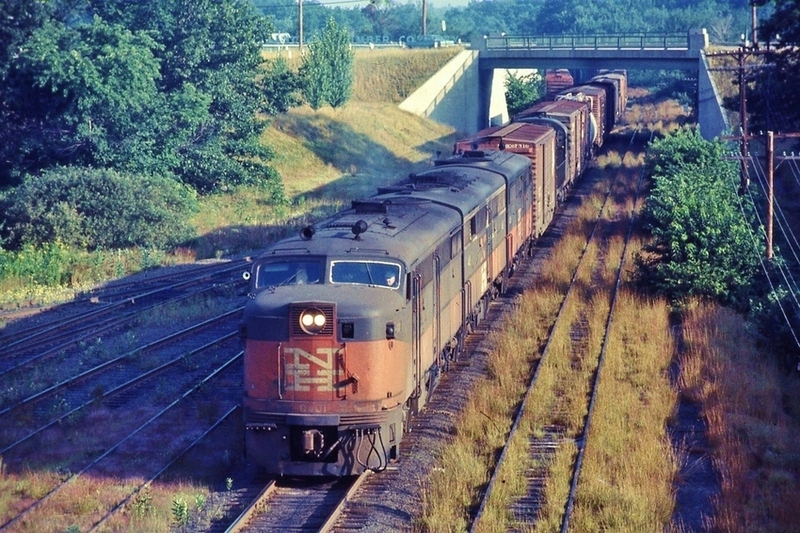 Once the coach train from Franklin has departed for Boston, the operator will clear 0401 to follow. .
Photographed by Ken Patton, August, 1967. Added to the photo archive by Ken Patton, March 17, 2019. Is that a deadheading road switcher behind the first boxcar? Thank you so very much for these awesome series of photos of this train!!! I lived in Sudbury from 1956 until the end of service on this line. This train used to come thru that town usually in the dead of night. Would you have any daylight shots of it in Sudbury? ?